My father and I would love to have a ship spotting holiday in Rotterdam. Ideally where we can watch the ships cruise by and see tug works taking place, My Dad is not able to walk too far and I have seen some great footage on youtube and wondered if anyone can advise a friendly hotel etc near the port inlet so we can get to see some container and tanker action passing by. Your help would e much appreciated and make a 81 year old man very happy, as well as the son !! Rotterdam-area is great for shipspotting but the problem is the position of the sun. In case you stay at Maassluis, it is always opposite of you, so bad pictures. Crossing with the ferry to Rozenburg is better. Two hotels at Rozenburg: Hotel Rozenburg and Hotel Pico (have not been there myself). At Rozenburg you can sit along the New Waterway near the the ferry-landing. Staying at Rozenburg and owning a car give you also to possibility to drive to the far end of the "peninsula": there you see Europoort and New Waterway. Take a look at Google-Maps for orientation. If your father is unable to walk much I would possibly suggest a Spido cruise from the centre of Rotterdam, there are several different tours, although you have to book ahead for some to guarantee a place, e.g. the full day tour to Europoort. But the Botlek tour is walk-up. The boat has facilities which may be important for a gentleman of your fathers age. Alternatively either stay at or go the Hoek Van Holland by train, then take the small passenger ferry to Landtong (the peninsula Pietr refers to. ), If you take the full round trip you go right into Maasvalke as well, and get close to big containerships and tankers. At Landtong all Rotterdam and Europoort, but not Maasvalke, traffic comes right past you. You can see Maasvalke traffic but need a long lens for photographs. However there are no facilities at Landtong unless a mobile snack bar turns up. It seems most of the people advising you are still living in the 1980s.... The good places for shipspotting in Rotterdam are no longer Maasluis or Rozenburg or Vlaardingen, not even the 'land tong' !! Shipping has changed completely in Rotterdam over the last 15-20 years and most of the traffic has moved to Europoort and the Maasvlakte, with only smaller tonnage passing Maasluis (feeders, chemical carriers, very few large containerships, the odd reefer - if you are lucky). A day at Maasluis/Rozenburg could actually prove very boring unless you are a big fan of small ships ! 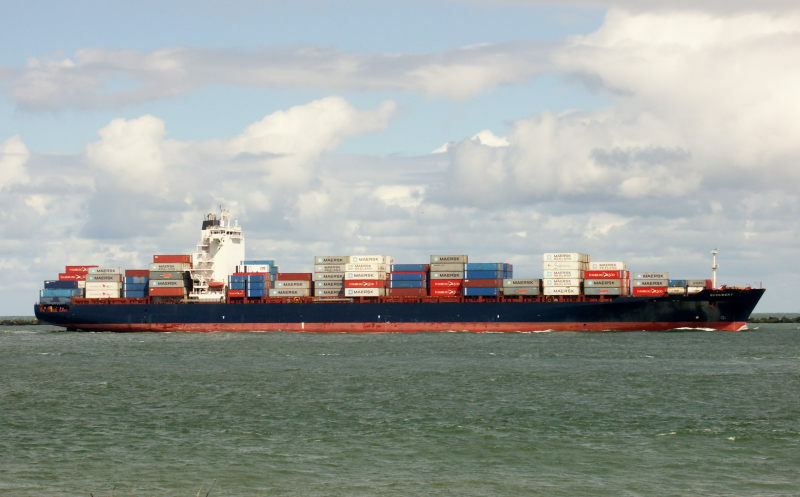 If you really want to see exciting shipping movements (large containerships, bulkers, tankers) and virtually spot EVERY ship coming in and going out of the port, you need to go to the very port entrance at the MAASVLAKTE. Obviously it is a long way to go from Rotterdam city, and you need a car for that, but the advantage for your father is that you can park your car on the beach over there, and spot ships from your car, without having to walk. The place is truly spectacular, you wont be disappointed. You may find Hotels/pensions at the nearby city of Oostvorne - not so close any more since the construction of MASSVLAKTE 2 but still easy to reach daily by car from the spoting place at the MAASVLAKTE/port entrance. A good - but expensive- hotel at Oostvorne is Wapen Van Marion. You may google the name to get more info. !!! today ,you can still make exellent pictures in Maassluis,Rozenburg and the landtong.On the Maasvlakte large ships do not come every day. Nothing wrong with Maassluis/Rozenburg/Vlaardingen/Landtong as photography locations. I've had excellent days at each in the last four months. At Rozenburg I've taken some of the best photos I've taken in the last year, the light can be spectacular. Maasvlakte is indeed a great spot, but if you don't have a car it's difficult to get to. I go to Hoek van Holland and sit on the breakwater - and have been really pleased with the results (I've done this in the last month, not the 1980s...). In case it hasn't been mentioned, if you get to HvH, the RET fast ferry to Maasvlakte is well worth a go. The round trip is an hour, and if you time it well you can have some excellent views of large moving ships. It's 5 or 6 euros. This photo has been shown 1,372 times since it was added to the site.